My year project has ended, a full circle. It’s been an interesting journey. I was not trying to compete with all the wonderful food bloggers out there (and there are many). I just did a simple blog (my first) to document a year of meals. It is fun to look back at some of the posts and remember exactly that day and what was going on. Makes me wish I had kept journals my whole life. You forget so much. I’ve learned a lot about my cooking habits, my menu choices and about myself…..
Part of me will miss posting our dinners daily but… I’m glad it’s over. I have aways wondered who looks at this blog so if you have followed me this year I’d love it if you would sign the comment section. I have a new blog planned for 2011 but I won’t be posting daily. I hope everyone who has visited the “What I Feed MY Husband” blog will check out my new blog and enjoy it as well. See you next year at Joan’s Kitchen. Best wishes and may 2011 bring you joy, love, laughter and good food! p.s. I think it might be hard to never come back here and post something again so maybe I’ll post the really nice meals I make…. If you’ve subscribed to my blog you’ll know if I do that. 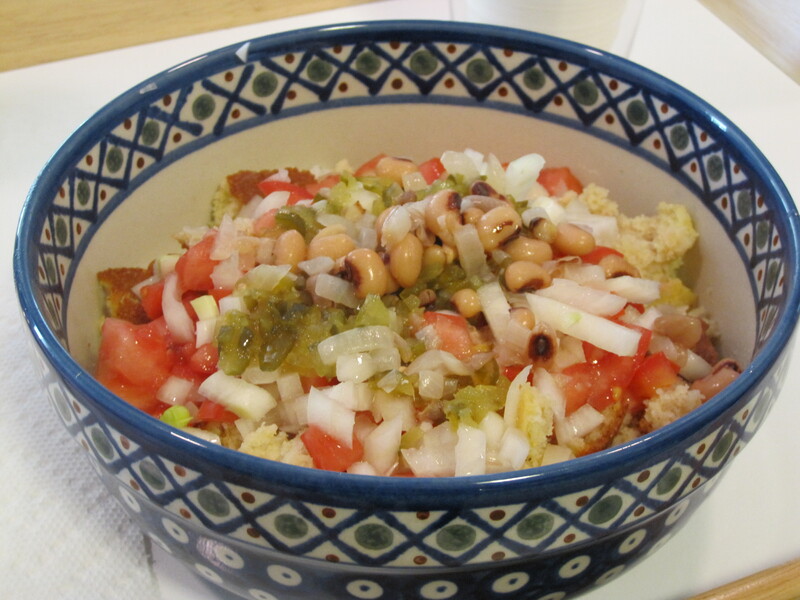 Like last year at this time dinner today was the traditional New Years Day Hoppin’ John…. Thanks for the kind words Jane. The pressure is off so I’m actually going to keep posting things occasionally. It’s nice to have an avenue to chat. Wouldn’t it be great to say what you’re really thinking though? Cheers! Good Luck on the next project! Just to let you know I have followed your blog and have enjoyed it! Thanks Gaynell. It was quite the commitment. Hope you’re well. I enjoy seeing your precious little grandson Jude growing up so fast. So wonderful mumsies. I am so proud of you, this was really hard work and a wonderful accomplishment and I am so glad I learned how to prepare meals from the world’s best cook, my mom. Thanks for all you support Emily!!! Awesome project mom, i loved looking at what you guys were eating. Thanks Seth your input was alway appreciated. Congrats Joan! I’m gonna miss this! But, I’m excited for your new adventure! Thanks Berkley for being a real fan.